The Precipitation Frequency Data Server (PFDS) is a point-and-click interface developed to deliver NOAA Atlas 14 precipitation frequency estimates and associated information. 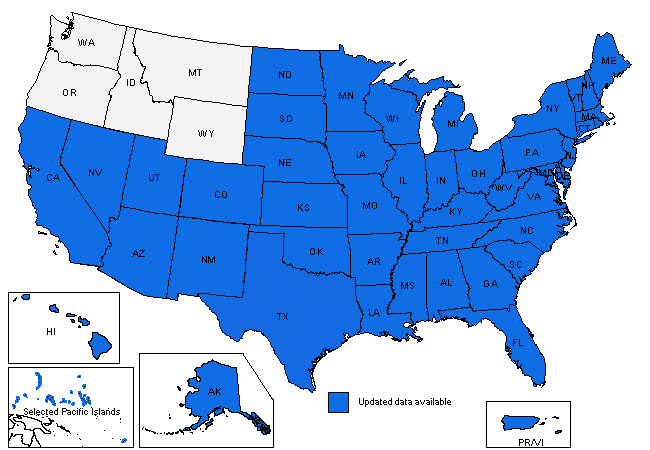 Upon clicking a state on the map above or selecting a state name from the drop-down menu, an interactive map of that state will be displayed. From there, a user can identify a location for which precipitation frequency estimates are needed. Estimates and their confidence intervals can be displayed directly as tables or graphs via separate tabs. Links to supplementary information (such as ASCII grids of estimates, associated temporal distributions of heavy rainfall, time series data at observation sites, cartographic maps, etc.) can also be found. Section 5 of the NOAA Atlas 14 documents provides additional information on the underlying data and functioning of the PFDS.